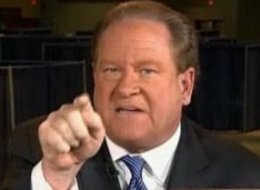 Ed Schultz is fired up... against Obama? There is no surprise that Mitch McConnell and the rest of the Senate GOP held middle class and small business tax benefits hostage in order to win an extension of the upper class Bush tax cuts. This was expected. My surprise is the embarrassing reaction by almost every progressive pundit and ideologue. While it is disheartening to me, Boehner and the rest of the GOP are sitting back with a glass of Merlot laughing at us. The anger from the professional Left is so inappropriately over the top that, to an outsider, it would seem as if Obama just committed an act of genocide. The fact is, as progressives, we need to figure out who we are and who we want to be. I always looked at the the Dems as a party of pragmatism, rationality and intelligence. Gut reactions, emotional decisions and macho hardheadedness was always the realm of the GOP, solidified by George W’s “gut” reaction to invade Iraq. Now many on the Left are starting to sound remarkably similar to the blowhards on Fox News. While the GOP’s decision to hold middle class tax benefits hostage was reprehensible, the President’s difficult compromise was the right decision. Without this deal, there was little chance the GOP would grant tax cuts for the middle class or extend unemployment for a record 13 months. But instead of heralding the positive points of this plan, now the Liberal pundits are vehemently attacking the President for compromising. This will achieve absolutely nothing. Politically this can be a powerful statement from Obama to an independent base that is sick and tired of the venomous fights between the Right and the Left. Here is a man that rises above petty divisions. Here is a President that is not playing the game in Washington, but making sure the unemployed millions have food on their tables. Instead of focusing their energy on that, the professional Left (Olbermann, Maddow, Press, Schultz…) attack their own President. A President who has achieved a historic compromise by extending unemployment to record levels. A President who was able to keep progressive tax elements in place. A President who refuses to allow gridlock to destroy the economy. Obama’s too intelligent to fight a war that he knows he can’t win and too compassionate to allow millions of people to go hungry. To him, that’s worth the $700 billion the GOP is adding to the national deficit. The pundits and Liberal lawmakers who criticize Obama on this compromise are either ignorant or cruel. Is it really more important to look tough than to help people? To these people ideology is more important than pragmatism, practicality and compassion. Get over it. It takes more guts to compromise than quarrel. Leave it to the Right-wing GOPers to decry any populist movement that doesn’t fit neatly into their narrow fiscal and social ideology. Even if the premise is about fairness and calm discourse in the media, the GOP pundits label it as either a Left-wing communist plot to destroy the fabric of our nation or, worse, an invalid movement started by a bunch of stoners, and the Rally to Restore Sanity was labeled as the latter. In fact, the stated and implicit purpose of the rally this past weekend was to encourage sane discourse on both the Right and Left. And while many of the attendees were Democrats pushing their own ideas, this was not at all the substance of the rally itself. these millions of cars must somehow find a way to squeeze one by one into a mile long 30 foot wide tunnel carved underneath a mighty river. Carved, by the way, by people who I’m sure had their differences. And they do it. Concession by conscession. You go. Then I’ll go. You go. Then I’ll go. You go then I’ll go. Oh my God, is that an NRA sticker on your car? Is that an Obama sticker on your car? Well, that’s okay—you go and then I’ll go. This is all well and good if you let the car in front of you go first, but when the Republicans are erratically driving Hummers and cutting off every reasonable mid-size sedan, it is not possible. The Right have louder, bigger and more offensive cars and the left has a responsibility to make sure that they aren’t cut off or out of the dialogue. While Stewart acknowledges that some of these drivers may be jerks, he also downplays the significance by saying, “that individual is rare and he is scorned and not hired as an analyst.” We all know this isn’t true. Just turn on Fox News. Jon Stewart is not a liberal — and I’m glad. While we need the Left to call out the Right (and vice-versa), we also need Stewart to call out the media pundits on both sides; something he is very good at. But in an effort to be “fair and balanced,” he has lost site of the truth behind the toxicity of the Right’s voice. The GOP knows this, but they need an enemy. And with an ignorant base, Republicans have written a narrative that paints Jon Stewart as a convenient antagonist to Glenn Beck. The tactic is working and making Jon Stewart more popular than ever.